WP Roadmap | Do you ever get lost when developing for WordPress? If only you had a map. I’d like to say thank you to WP Engineer for blogging about the WP Roadmap project. I’ve never done a very good job of publicizing, so getting external links of this sort is extremely helpful. Thank you Alex. Since the site has gotten a healthy bump in traffic, I’d just like to request that if you find a flaw in the data set, encounter a bug, or have a feature request/idea, please contact me and tell me about it. P.S. I know, I know. I really need to work on redesigning the site in order to 1) make it look nicer and 2) make using everything more smooth. It’s hard to believe that I’ve had this site up for about eight months now. It’s even harder to believe how little attention I’ve given it. Earlier today, I updated the WP-Roadmap to have datasets for 2.6-2.8. I’m also trying to finish up the code that I started way back when that will allow for automated inclusion of new releases as well as automatically run through trunk builds. I’ve also identified a few missing elements. I’m working on getting the code updated to include those missing elements and will post an update as soon as I’ve rebuilt the data. I’m very pleased to offer you a much-improved set of data on the site. A number of other improvements in the works, but I wanted to provide this useful information ASAP. Added the roadmap code to the admin backend and generated data for each link in the primary and secondary nav structure of the admin view. The long full file paths have been removed. In some instances (where it would be obvious that the path was scrubbed), the ABSPATH portion of the path has been completely removed. In other instances, the ABSPATH portion was replaced with the literal string ‘ABSPATH’. The line numbering is now accurate. In my previous version of code, some insertions added additional newlines which resulted in modified line numbering in select files. This flaw is no longer present. Optimized the database configuration and table structures to make the large page views load much more quickly. Added zebra striping to the table output so that it is much easier to follow all the data from a specific row. Added simple links to the base functions to either PHP or WordPress references. Need a good theme for the data side of things. I hope to have a better one for you guys soon. I dug around over the weekend for a nice theme with varaible width, but I could not find one. I’ll try to hit up some people I know to see if we can’t get a streamlined theme with variable width. The overall presentation of the data leaves much to be desired. Links for specific actions, filters, etc that go directly to the Codex. I considered having this information internal to the tool, but why create yet another repository of that information when the Codex is here now? If we all work on cleaning up the Codex, adding pages, and adding compatibility notes on how certain internals of WordPress have changed over time, everyone will be helped. Code views. This will allow you to quickly see where each point along the Roadmap resides in code. Add more page views, versions, and descriptive information. Tree-view of the data in an image. I’m playing around with the code on this, but it still requires a lot of work. Roadmap folding. Just as you fold a regular map to focus in on a specific area of interest and to make it easier to handle, I want to do the same with WP Roadmap. Imagine being able to expand out just specific areas of the map that stem from a specific execution branch. Not only will this feature make browsing the data easier/faster, it will also give everyone a much better understanding of how all the parts connect and work together. Include all function calls in the Roadmap. This will be a tall order as there are a great number of them. If I improve the loading of the Roadmap with some smart AJAX calls, I could reduce the load to on-request data, so that this would be possible. If I can improve the interface sufficiently, I’ll definitely be itching to take on this challenge. Compare versions and pages against one another. First Day, Nearly 300 Visitors! Wow! I’m absolutely blown away! 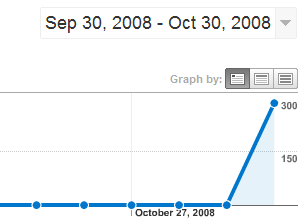 This site didn’t even exist until yesterday morning, and it received 286 hits on its first day. Thanks to everyone who has taken an interest about this project and started spreading the word. Due to the overwhelming response, I’m going to work hard this weekend in order to give all of you as many of the features that I talked about as possible. I’ll also get both this site and the roadmap front-end site a face lift. No promises on beaty however as I’m a coder and not a designer. A big thank you goes to Adam Hunter who just volunteered to help out with the project. Hopefully we can get this site looking and working much better over the next few days.